Bath & Body Works, an America’s favorite fragrance brand, with keen devotion to fragrances and a strong history in quality formulas, breadth of variety from body to home, is America’s favorite fragrance brand. The exclusive Bath & Body Works range available in every store includes: 1. Signature Collection – the world’s best assortment of wearable, fashionable fragrances 2. Home Fragrance – an assortment of room sprays, diffusers and the world’s best candles in luxurious scents 3. Hand Soaps and Sanitizers – an unparalleled collection that gives customers the opportunity to wash away germs with uplifting scents and conditioning care for their hands and 4. Aromatherapy – which uses fragrant oils and absolutes to bring about a sense of total wellbeing. There are two stores in Singaopre, @ Marina Bay Sands and Takashimaya. 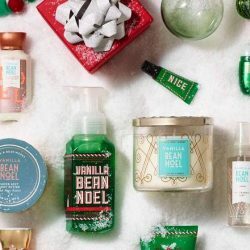 23 - 25 Nov 2018 Bath & Body Works: Black Friday Sale with Buy 3 Get 3 FREE Everything! The best haul of all happens Friday, Saturday, and Sunday ONLY! Bath & Body Works' ENTIRE STORE will be Buy 3, Get 3 FREE! (seriously, everything!) Tag your #BlackFriday shopping squad  now! For 2 days only from 17 to 18 December 2015, buy 1 get 1 free from Bath & Body Works Holiday Collection! Get a candle, body lotion or handle soap for a Christmas gift! Get your favourite Bath and Body Works items today with their Black Friday offers: Buy 2 Get 1 Free, or Buy 3 Get 2 Free for the entire store! Perfect for Christmas gifts! WEEKEND SPECIAL! Free limited edition tote bag (Worth SGD40) with every SGD100 spend in a single receipt. Available at Marina Bay Sands and Takashimaya S.C. Store from 14 to 16 November 2014. Stock your sink with your favorite flavors. Bath & Body Works offers BUY 2 FOR SGD14 promotion. Bath & Body Works offers Large Candles 2 for $50 Promotion. First on the shopping list: a delightfully refreshing Trio of Lemon Pomegranate Cream. 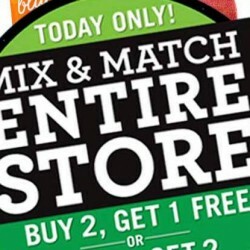 BUY 3 GET 1 FREE* Lowest-priced item Free. 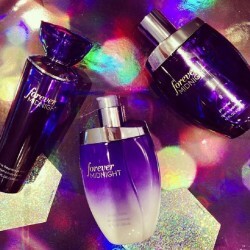 Bath & Body Works offers a fine day for a NEW fragrance! BUY 3 GET 1 FREE. Lowest-priced item Free. 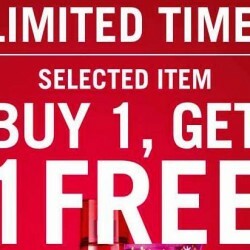 Bath and Body Works offers BUY 3 GET 1 FREE promotion now! Bath and Body Works brings you Luxury for everyday. Welcome the weekend with more savings! SGD40 each for all Eau de Toilette! You can frame this present perfectly. Feel the comfort of Paradise now! 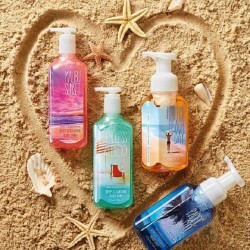 Bath & Body Works brings you a trio promotion of Pure Paradise! This long weekend, Bath & Body Works offers Select Gift Sets at SGD40! Available only from 3 – 5 October 2014! 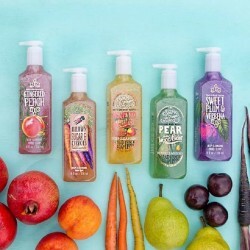 Sudsy savings from Bath & Body Works! BUY 5 FOR SGD30 for all hand soaps! Get a FREE* Limited Edition pocketbac with any purchase! Available only at MBS store, B2-42, from 19 – 21 September. 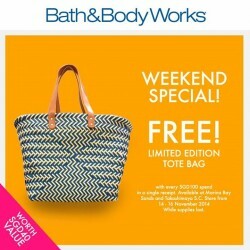 Bath & Body Works Weekend special: FREE* Limited Edition tote bag worth SGD58 with any purchase over SGD100. First 50 customers only, so hurry! Packing for the PerfectWeekend. What are you bringing on yours?! Enjoy TrioTue promotion at Bath & Body Works. BUY 5 FOR SGD30 for all hand soaps! Give your grad the Perfect Weekend! Bring the beach to your sink. Enjoy BUY 2 FOR SGD14 at Bath & Body Works! Perfect for nights at the beach house or afternoons on the porch. 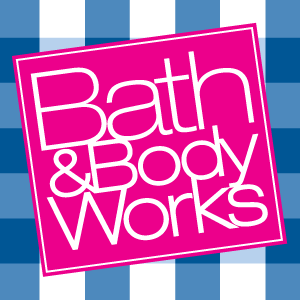 Enjoy Weekday Special at Bath & Body Works: BUY 2, GET 1 FREE* for all candles! Luxury is now for every day at Bath & Body Works, enjoy buy 2 get 1 free Prestige Collectionfor limited Time Only. Enjoy an endless weekend – All day! 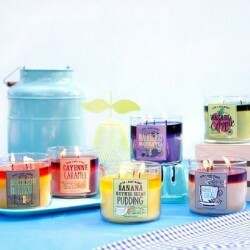 Weekday Special from Bath & Body Works : BUY 2, GET 1 FREE for all candles! Valid Monday – Thursday only! Get the best Bath&Body Works Singaporedeals, coupons, coupon codes, voucher codes, promotion codes and promotions from BargainQueen.sg. Check out the best Bath&Body Worksdeals and offers, enjoy the biggest save!